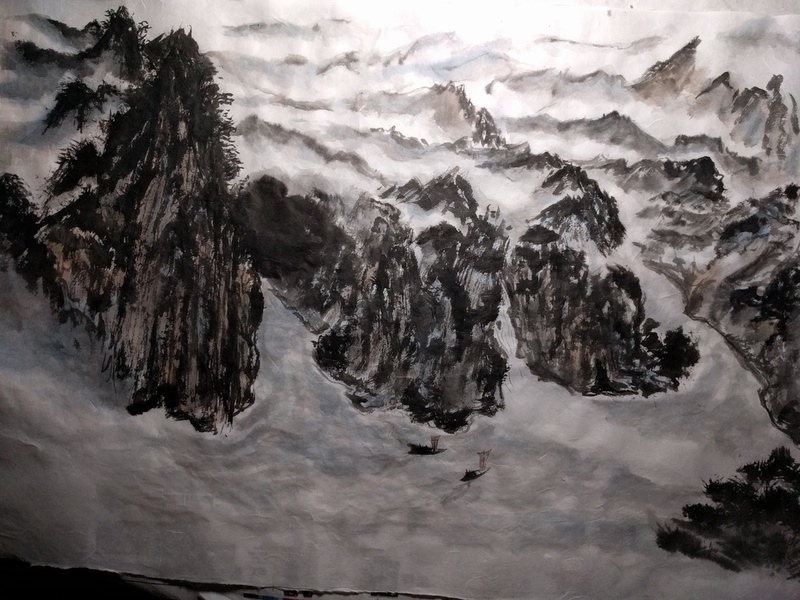 On, 25 Jun 2016, an italki friend, Julius Ku sent me a marvellous Chinese painting that he did and asked me to pen a classical poem for him to complete his work. Below is the version that appeals to me most. After studying the painting for awhile, I came up with a draft of to describe the painting. I liked the way how to boats are depicted simply. 山雲接海迎小舟 The cloudy mountains receive the ocean and welcoming the little boats. 松峭参天拜 Pine cliffs bowing to heaven. 自然依舊待/侍千秋 As nature remains waiting/serving for a thousand autumns. 無意不識入仙境 Unintentionally and unknowingly, I stumbled into the fairyland. Although the result is solidifying, I still think the poem is too contrite; words not too elegant and the flow of sounds not too smooth. 1. Pine trees are longevity symbols but still has an end. The sky doesn't. 2. The peach source is an allusion to a story when a fisherman inadvertently stumbled into paradise filled with blossoming peach trees. He spent a day there before returning home. However, he could not find his way back the next day. This is a frequent theme in Classical Chinese poems. 心空愰惚入仙境 My heart is empty and suddenly the fairyland I entered. 松冠峭壁参天敬. Sheer cliffs crowned in pines paying respect to heaven. 必是心愰入仙境. Must be in my absent-mindedness that I stumbled into the immortal's realm.